Salt and Sawdust written by R.K. Narayan is the story of a wannabe novelist who becomes famous as a cookery book writer though she could hardly distinguish between salt and sawdust! Veena and Swami are a childless couple in Malgudi. Swami works as a weaving supervisor in Coomer’s silk mill, while Veena is a housewife, who spends most of her time in reading magazines and in thinking about writing a novel. The cooking is completely done by Swami, as he is a man of good taste and appetite and knows quite well that his beloved wife may have been a good scorer in BA English, and equally talented if ever she wrote a novel, but as far as cooking is concerned, she is an utter failure. Whenever she cooked, he had to swallow each morsel with difficulty, so he takes it upon himself to provide for this basic need, leaving ample time at Veena’s hand. Veena, with support and encouragement from her husband, undertakes to write a novel about a Chinese dentist, who falls in love with a Tamil girl, and marries her at the end. She wants to do this creatively, and writes the novel in two languages- English and Tamil. This novel writing brings husband wife closer, and Swami does help Veena establish a good story, as they discuss it over dinner. The interest develops so much that Swami ends up writing ten pages in the 200 page novel. The local printer Natesh, and the stationery man Bari quote a high amount for publishing the novel. The husband- wife duo decide to move to Madras to get better exposure. That brings Natesh and Bari down from high pedestal and they agree to pay hefty amount as advance, while they themselves will bear the cost of printing. 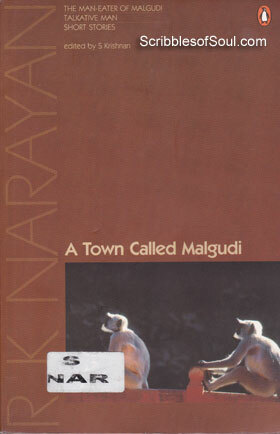 Here, may be Narayan has included his own experience with publishers, in his atypical humorous vein. However, here comes the twist as Natesh wants to print a book on wedding feast, ironically most of which was scribbled by Swami and a small portion was accepted by Veena after rephrasing it in her own language. But, now she has to develop Swami’s notes if she wants to become a writer. So, the book that is published is not a novel, but a recipe book, written by a woman, who knows nothing about cooking! Narayan is adept at finding irony and humor in day to day life situations, which most of us overlook. And, the present story is no different. Here, he has presented a perfect though unusual couple, whom destiny brings on cross roads, and yet they are able to solidify their relationship, by lending support to one another. Though, most of the sacrifices and support comes from the husband’s end in this strange tale of marital love. But, irony is just one of the many elements. It is also a satire on the breed of writers, who write on topics they hardly know anything about, on the craftiness of printers and publishers, who wish to earn profit by quoting high prices and dwindling the efforts of authors. And, still what shines through is the love rendered by a loving man, on his less than perfect wife! I loved the character of Swami, who is a devoted husband, loves his wife so much that he is ready to overlook her shortcomings, and is always encouraging her to do what she is good at. In the exact role reversal of domestic arrangements in Indian homes, he is the one who cooks and supports his wife, while she remains philosophical and wanders in the town to get ideas for her novel. In a way, Swami is the pillar of the family, a pinch of humble salt transforming the bland, tasteless food into divine cuisine, while Veena acts as sawdust, a by-prodcut of pulverized wood, which though appears volumnious and all pervading is actually worthless! However, Narayan combines the two perfectly, and creates a wonderful story that remains true to its name. A comical lovely story!